While much of the country celebrated Columbus Day yesterday, South Dakota celebrated Native American Day. We had a full school day, but all the classrooms had special lessons to help our Native American students develop a greater sense of pride in their heritage and culture. As students walked into the building they were smudged with the smoke from sage. They then participated in a Four Directions prayer service in the school gym to begin the day with a good spiritual grounding. 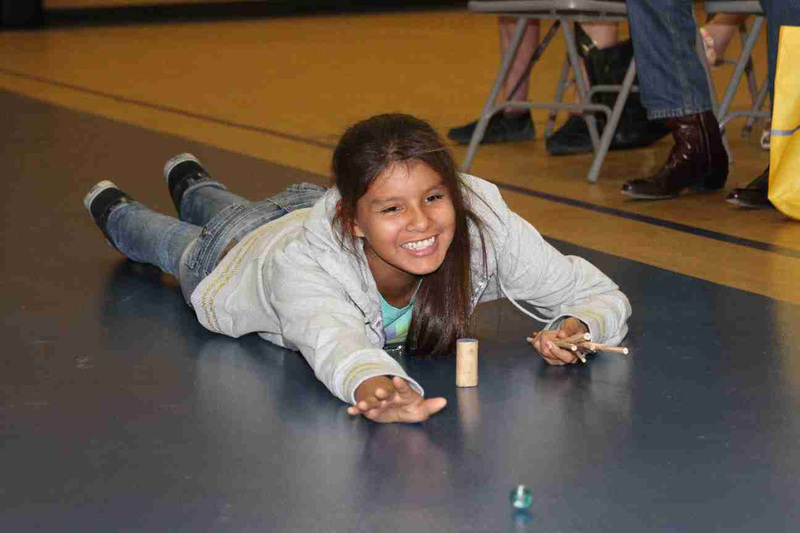 Our students took part in Lakota hand games, drumming and singing while their opponents tried to win wooden counting sticks while guessing which hand held the winning wooden dowel. In the old days, bones were used in this game. As our Lakota students learn the rules and strategies better, they can participate in contests against other schools. We have an Artist in Residence working with our kids this week. His expertise is in brass instruments and the kids were thrilled and awed when he brought out a tuba and let a few of them try. They were blown away (figuratively)! Four students and one teacher from our sister school in Handrup Germany arrived today. They will spend the next two weeks with us in a cultural exchange. The German students are the ones who hosted our students in their homes last summer, and I saw hugs and handshakes and joyful reunions all around. They will get to experience what it is like to live in St. Joseph’s homes and travel around the state to learn some history and culture of the Lakota people. My day was enriched by two visits from donors passing through on their way to the Black Hills for vacation. One couple was from Virgina Beach, and I had time to take them into the school and let them see some of our young scholars in action. The second couple came from Youngstown, Ohio, and I met them in the chapel on my way to community prayer. We talked about the symbolism of the artwork in Our Lady of the Sioux Chapel. I met the crew moving all our artwork into the newly completed storage facility at our Akta Lakota Museum. The curator from one of the state museums said we have a wonderful facility that will preserve our arts and artifacts well. The large back room is starting to come to life as more paintings, sculptures, arrowheads, beaded medallions and countless other treasures add color and texture to the shelving and storage areas. Our students responded well to our first fire drill of the fall, even when the fire crew blocked three of the regular exits and they had to scramble to figure out an alternative. That’s so necessary if there is a real fire. Dave Z., our new Cultural Associate, uses a wheel chair and had to get creative when his regular ground floor exit was closed. This just reinforced the emphasis we’ve put on making all the older buildings on campus more handicap accessible over the past few years. Our safety and security committee meets once a month to review drills and other issues. Living in a very rural area, wild animals become an issue, and lately we’ve had too many critters on campus. The deer that graze on our grass, and the wild turkeys that waddle around add charm to the campus. But we’ve also had lots of skunk encounters. Besides the smell, rabies is a concern. One of the sheriff’s deputies is also a trapper, and he’s helping us out. This week we removed five skunks, a possum and three cats. A farm family readily accepted the cats to help control their own little critter population. At St. Joseph’s, teachers work to incorporate Lakota (Sioux) culture into their lesson plans for the day. Outside of St. Joseph’s Indian School,the state of South Dakota has put out standards for cultural teaching. In Sandi’s math class, students wrote and solved number sentences using the Lakota language instead of digits. In Steve’s fourth grade class, students read “A Little Boy and Girl in the Clouds” and “Star Boy” by Paul Goble. Fifth grade students learned about Winter Counts and constructed their own. Sarah’s eighth-grade students read The Lakota Way: Stories & Lessons for Living by Joseph Marshall III. In computer class, Gina worked with students to find a map of South Dakota reservations and discuss where each reservation is and which ones they are from. Using Sherman Alexie’s essay, “The Joys of Reading and Writing, Superman and Me,” students in Craig’s class worked on identifying important values, philosophy, and beliefs in writing by Native Americans. In Linea’s reading class, students listened to The Eagle – empathizing Compasion (wah-un-shee-lah-pee) – to care to sympathize and The Story of No Moccasins – empathizing Humility (un-shee-ee-cee-hay-pee) – to be humble, modest, unpretentious. Third grade students watched a Native American storyteller share the story of why rabbit is the way he is. After sharing and discussing the story, students made an animal poster labeling each part along with the Lakota word. First grade students read “The Legend of the Indian Paintbrush” by Tomie dePaola. The students created a Native American boy or girl and placed shapes in a pattern on the chest to represent the traditional beadwork and patterns on the leather.